The Valley of the Kings in the west bank of Luxor houses the tombs of Pharaohs and powerful nobles of the New Kingdom for a period of nearly 500 years from the 16th to 11th century BC. With discoveries in 2005 and 2008 of tombs, the valley is known to contain 63 tombs and chambers. The royal tombs are decorated with scenes from Egyptian mythology and give clues as to the beliefs and funerary rituals of the period. Almost all of the tombs seem to have been opened and robbed in antiquity, but they still give an idea of the opulence and power of the Pharaohs. While most of the tombs are not open to public, we visited three of them (the tomb of Tutankhamun requires a separate ticket). To minimize the time spent in the tombs by tourists, the tour guides are no longer allowed to lecture inside the tombs, and visitors are expected to proceed quietly and in single file (one visit per tomb) through the tombs. More importantly, photography is not allowed in the tombs. Each tomb open to the public is guarded by one or more men – one to check the ticket outside the tomb and another one to make sure tourists are moving on rapidly and no one is taking pictures. When I visited the first tomb of Ramases IV, I was the only one in the tomb. There was only one guard for the tomb. He checked and punched my ticket at the entrance, and I walked inside with no supervision. 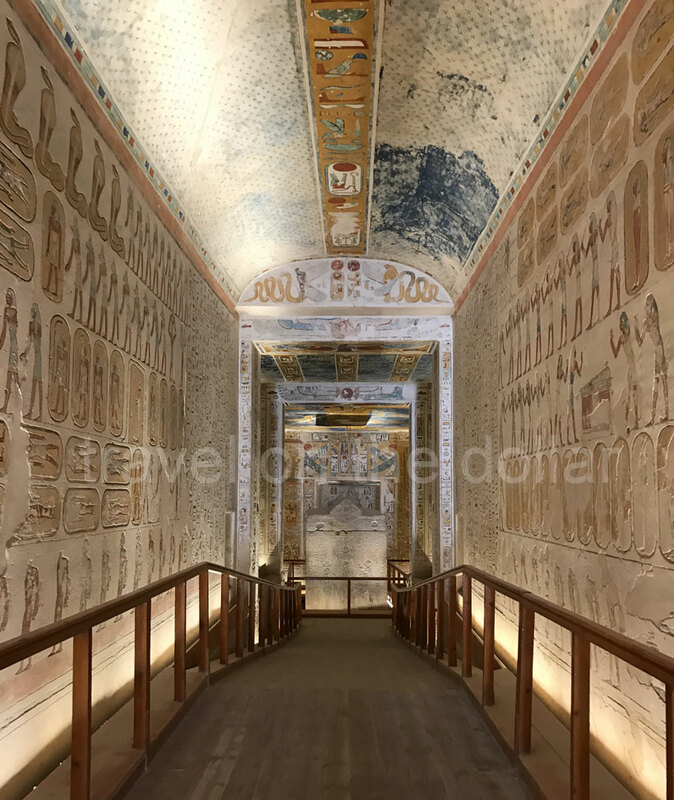 The tomb is at the end of the downhill hall that has decorations of Egyptian mythologies all over the walls, leading to the tomb at the end of the walkway. After about seven minutes, the guard walked in the hall, next to me and made some small talk like where am I from and what do I think of this. Speaking good English, he started to tell me some history about some of the drawings there. And in a minute, I was asked to show my phone, open the camera app and check the pictures, making sure I haven’t taken any pictures. This is while he was holding my phone. Having confirmed that I did not take any pictures, he asks me if I want to click any. However great it would be to take any, I insisted that photography was not allowed. Almost convincingly, he said “it’s okay to take one.” So I clicked one hesitantly. And that’s when the scam began! As we walk out of the tomb, he tried to scare me by saying I was in trouble because taking photos inside the tombs is not allowed. I knew he wanted money which was confirmed when he asked for EGP 100 (about $6) for me to keep the picture and go. I declined to give any money and by this time we were at the door of the tomb. He stopped there and said “you are in trouble my friend. And I’m trying to help you.” I didn’t budge and asked him to talk to my tour guide. This is when he looks around, thinks twice and hands my phone over to me. If you are visiting the tombs in the Valley of the Kings, please do not take any pictures to preserve the monuments; but also be aware of this scam going on there to get money out of you. If you happen to fall for this scam, like I did, stand firm and explain your situation to the authorities and your guide. It was a mistake on my part to have taken that picture above, but that mistake gives me an opportunity to let you know about this scam. « Visiting Abu Simbel for Sun Festival? Think again!